Is your mattress lumpy and uncomfortable? Do you find yourself not sleeping as well as you’d like to? It may be time to throw out the old mattress and get a new one. When you are shopping for a new bed, consider purchasing an air mattress. They are the ultimate level of comfort. The beds are designed using special air chambers throughout the mattress. Each side of the bed can be filled with more or less air depending on your comfort level – without adjusting your partner’s side of the bed. Once you have your air mattress, it’s good to know have the basics of air mattress troubleshooting so you can handle any issues that arise. This covers things like the mattress losing air, faulty processors, etc. Fill up the mattress as full as you can get it. Take off the covers and the foam layers until the air core is exposed. Push down firmly on each side to determine if both air bladders are full. Remove the processor hose from the mattress by using the quick disconnect button. If there is no leak, the mattress will stay full because the one way valve is designed to prevent air loss when the processor is off. Check the mattress after a few hours and repeat step 2. The mattress will still be firm if there is no leak. If there is a leak, you will need to patch it using a sealant. Reconnect the processor hose and fill the mattress again. If the leak persists, you will need to contact the company for an air core exchange. Check the power supply that the processor is plugged into. Is it getting power? Is it plugged into a surge protector? Make sure the power surge is turned to On. If it goes to a standard outlet, check to see that it’s completely in the outlet. Look at the hand controls to see if they are still connected to the processor. Sometimes they become loose or disconnected. Try using the Deflate option on the hand controls one at a time. 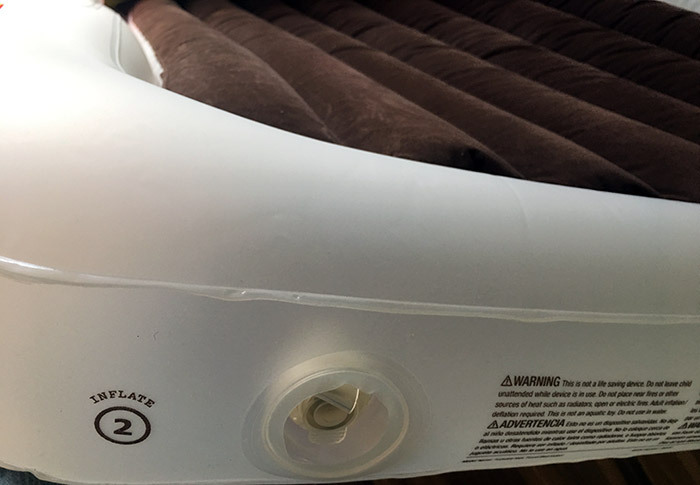 The air mattress will let air out if the controls are working the way they should. Deflate the air bed to 50% air and leave it at that to test the processor. The air mattress will refill itself if the processor isn’t damaged. If it does, you have successfully fixed the issue. Otherwise, continue to the next steps. Power cycle the processor by unplugging it from the outlet. Let it sit unplugged for a full minute. Reconnect the processor after the minute is up. Try using the deflate buttons again. This time if it doesn’t work, let the controls sit unplugged for ten minutes to reset the overheating safety mechanism built in to the processor. Plug the controls and processor back in. If it doesn’t work, the controls are shot and a professional is needed. Follow the air processor hose to check that it isn’t kinked at all. Sometimes when you are moving furniture around, it gets trapped against the headboard and will kink the hose, preventing it from working properly. If this is the issue, simply unkink the hose and move the furniture so it doesn’t happen again. If the hose isn’t kinked, you need to take further measures. Take the cover off the bed and check the hoses that are inside the mattress. Straighten out any kinked or twisted hoses that you see. Put the cover back on and see if that helps. If not, proceed to the next step. Repeat the power cycling steps from the previous section. If the processor doesn’t reset, it may be faulty and need to be replaced. Check to see that the hand controls are on the correct side. Sometimes when you connect them, you mix them up. LH goes on the left side and RH goes on the right side. The sides are determined by the foot of the bed, not the head. Follow the cords and make sure they are properly attached to the bed. Unkink any cords and re-attach disconnected or loose wires. Check the processor and see that the air hose is connected correctly. Disconnect it and replug it in. When you hear a “click” noise you know you’ve done it right. Try the hand controls again. Press the Deflate button to see if air releases from the mattress. If so, you have successfully troubleshooted the issue. If the problem persists, contact a processional. When you can no longer troubleshoot the issue yourself, you should hire a professional to fix the bed. You can contact the store you bought it from and ask if they provide services. You can also check to see if you have a valid warranty with the bed. If so, you can call and schedule for someone to pick up the bed and fix it. They may even replace it depending on which type of warranty you have.